Why OC Dental Center Santa Ana for Porcelain Bridges? Our Santa Ana dentistry is led by dentists with over 20 years of experience. We believe that a great dental office needs to have friendly & knowledgeable staff, experienced dentists, and always be concentrating on keeping up with the highest technological advancements in the dental care industry. Our patients love that they are getting the best dental bridge treatments available: minimal to no pain and effective. A porcelain dental bridge is a solution for those looking to fill in a gap from a missing tooth. The teeth on either side of the gap are called your abutment teeth, which serve as the base for the entire bridge. Two dental crowns are placed on each of these abutment teeth. In between the dental crowns is the porcelain connector tooth (pontic), which is placed in the gap. The porcelain that makes up the dental pontic is a white, durable material that mimics the look and strength of a human tooth. Why Do I Need a Porcelain Bridge? 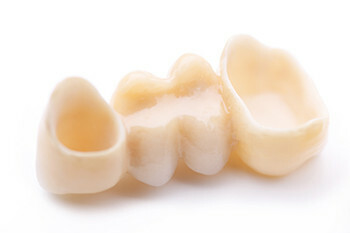 We use porcelain bridges for our patients who are looking to fill a gap in their teeth from either a lost tooth, or a tooth that needs to be removed and replaced. OC Dental Center not only uses advanced technology in our office, but also organic, vegan, and all-natural toothpaste, mouthwash and other dental products to gently take care of our patients' mouths before and after procedures. What Is the Porcelain Bridge Procedure Like? It typically takes two dental office visits to complete everything from the consultation to bridge completion and insertion. The first visit is mainly our dentist inspecting your mouth to ensure that a dental bridge is the right solution for you. We will check your dental history and also see what current dental work has been done on your teeth and gums. After we determine that a dental bridge is perfect to correct your dental problem, we will take a mold of your current teeth, and possibly take X-rays and use 3D imaging to create the perfect artificial tooth that will fit correctly inside your mouth. Then on your second visit we will gently file down your teeth surrounding the gap into cylindrical shapes that will serve as the base for your porcelain bridge. The final step in the process is cementing the two crowns and artificial tooth onto your base teeth completing your smile! We at OC Dental Center understand that cosmetic dentistry is more than a procedure, it's an artform to really create a dental bridge that looks great with your smile. You can trust our experienced Santa Ana dentists at OC Dental Center to give you the smile makeover you're looking for!